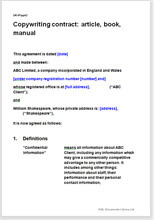 This is a straight forward contract for any copy writing in any industry. It is written for the client to initiate and stay in control. It is intended to make sure you, the client, get what you have paid for. It provides for an assignment to you of all created work. It does not include a specification of work. That is assumed to be set out in detail in a schedule. Because the work you want done is intellectual property it is subject to law that does not apply if you want your car serviced or your accounts drawn. We cover all the relevant matters to give you strong protection. You may want to use the writer more than once (this is an “umbrella” agreement). Your writer may not be in your country.